A new take on a Guatemalan folk tradition, Hali Emminger's tiny, handmade doll takes away your worries. A new take on an old Guatemalan folk tradition, Hali Emminger's tiny, handmade doll symbolically relieves you of anxieties big and small. Tell her about your nagging fears, and she'll do the worrying, so you don't have to. Traditional worry dolls go under children's pillows to soothe them as they sleep. Hali's necklace version allows yours to hang with you all day as a reminder to let go of grown-up woes. Whether it's "I'm afraid I'll act like a doofus on my date!," "What if the house closing doesn't go through?," or both, whisper to your doll and she'll silently gentle your jitters. So what if people see you talking to her? Let your new little pal worry about that. Choose blue, pink, or black and white. Handmade by female-owned artisan businesses in Panajachel, Guatemala. Growing up in Buffalo, New York, daughter of a carpenter and granddaughter of two generations of tailors, Hali Emminger “was always crafting, tinkering, and melting things,” she says. While majoring in sculpture and media and art education at Virginia Commonwealth University, she traveled to Guatemala to help women’s groups in the Lake Atitlán region dream up handmade products for sale in the US. Their motivation to help support their families stuck in her mind as vividly as their “magnificent craft traditions,” she says. She now lives and works in a 100-year old Brooklyn brownstone studio, working directly with women-led artisan groups. For making the Worry Dolls, “they set their own production price” she reports proudly. 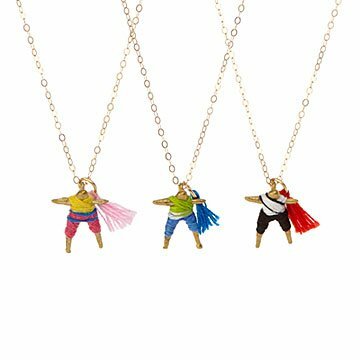 She also donates a portion of proceeds to a nonprofit that helps Guatemalan women create a better future for themselves, their children, and their communities through micro finance and education. Keep dry and avoid excessive oils and body products. Love it & the meaning behind it! My grandmother gave me a worry doll necklace as a small child & I loved it! Flash forward 30+ years & I have no clue where it is. Therefore, I HAD to scoop this up when I saw it online! I love this necklace! I also love that a portion of the sale goes back into an organization to empower women!